There are 26 Assisted Living Facilities in the Riverview area, with 6 in Riverview and 20 nearby. The average cost of assisted living in Riverview is $2,750 per month. This is lower than the national median of $3,346. Cheaper nearby regions include Brandon with an average starting cost of $2,522. To help you with your search, browse the 95 reviews below for assisted living facilities in Riverview. On average, consumers rate assisted living in Riverview 4.2 out of 5 stars. Better rated regions include Valrico with an average rating of 4.7 out of 5 stars. Caring.com has helped thousands of families find high-quality senior care. To speak with one of our Family Advisors about assisted living options and costs in Riverview, call (855) 863-8283. Riverview is an unincorporated community located on the shores of the Alafia River. It has a relatively small senior population with just over 9 percent of the community's 71,000 residents aged 65 and older. This senior population is can choose from 26 assisted living facilities in Riverview and nearby communities offering accommodation and care. Assisted living facilities in Riverview and throughout Florida are monitored and licensed by the Agency for Health Care Administration. Different licenses are available to the facilities based on the type of care they provide. Riverview has warm weather throughout the year. In July the average high temperature is 91 degrees. The average low in January is 49; seniors hoping to escape cold winters may appreciate the warmer winters here. The city doesn't get snow, although it does typically get 51 inches of rain, 12 inches more than the national average. The Sunshine Line offers transportation to seniors in Hillsborough County, including Riverview. Fees for this door-to-door service are on a sliding scale based on the trip purpose and the rider's income. The Riverview area is home to world-class medical facilities, including St. Joseph's Hospital - South, in the event of medical emergencies or illness. Hillsborough County, including Riverview, has mixed air quality. Particle pollution levels are good, with the county receiving an A grade for this category in the State of the Air 2018 report. The county received a failing grade for ozone pollution, which may impact the health of seniors with respiratory illnesses. Riverview has an overall crime rate of 14 crimes per 1,000 residents, which is lower than 77 percent of Florida communities. It also has one of the lowest crime rates in the nation when compared to communities of a similar size. Safety-conscious seniors may find this eases some of their concerns. Florida has no state income tax, which lowers the tax bills of seniors in Riverview. In addition, sales taxes in the state are close to the national average, which can help the budgets of seniors on a fixed income. Assisted Living costs in Riverview start around $2,750 per month on average, while the nationwide average cost of assisted living is $4,000 per month, according to the latest figures from Genworth’s Cost of Care Survey. It’s important to note that assisted living rates in Riverview and the surrounding suburbs can vary widely based on factors such as location, the level of care needed, apartment size and the types of amenities offered at each community. 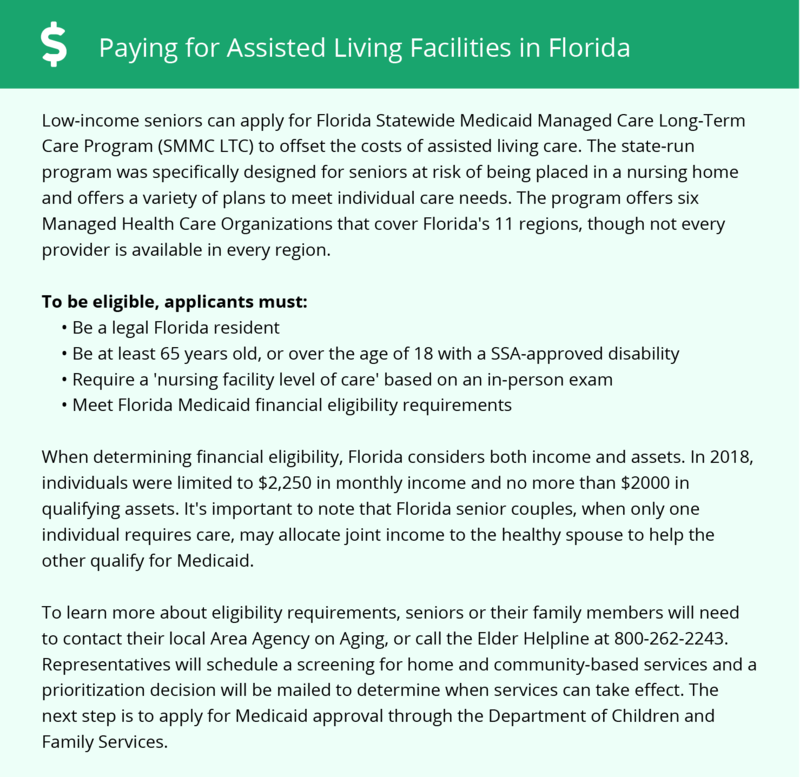 Seniors in Riverview may be able to access financial assistance for their assisted living costs through the Medicaid Long-Term Care Program or the Assistive Care Services waiver. The Optional State Supplement is also available to seniors who receive Social Security Income. Riverview and the surrounding area are home to numerous government agencies and non-profit organizations offering help for seniors searching for or currently residing in an assisted living community. These organizations can also provide assistance in a number of other eldercare services such as geriatric care management, elder law advice, estate planning, finding home care and health and wellness programs. To see a list of free assisted living resources in Riverview, please visit our Assisted Living in Florida page. Riverview-area assisted living communities must adhere to the comprehensive set of state laws and regulations that all assisted living communities in Florida are required to follow. Visit our Assisted Living in Florida page for more information about these laws.